The U.S. Army Corps of Engineers will stop Lake Okeechobee discharges to the east and reduce releases to the west, according to the Corps. All Palm Beach County-operated beaches are now closed. Phil Foster Park, Peanut Island and Ocean Ridge Hammock were the latest to be closed as a precaution after reports of red tide. 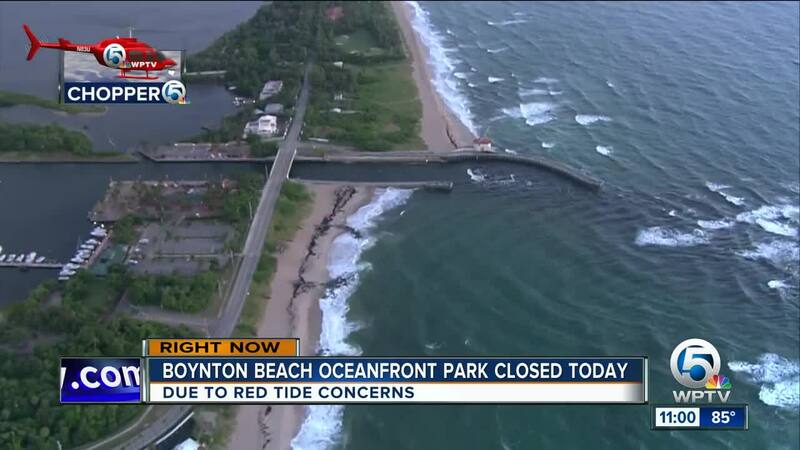 Earlier Thursday the city of Boynton Beach said that Boynton Beach Oceanfront Park would be closed today due to red tide. 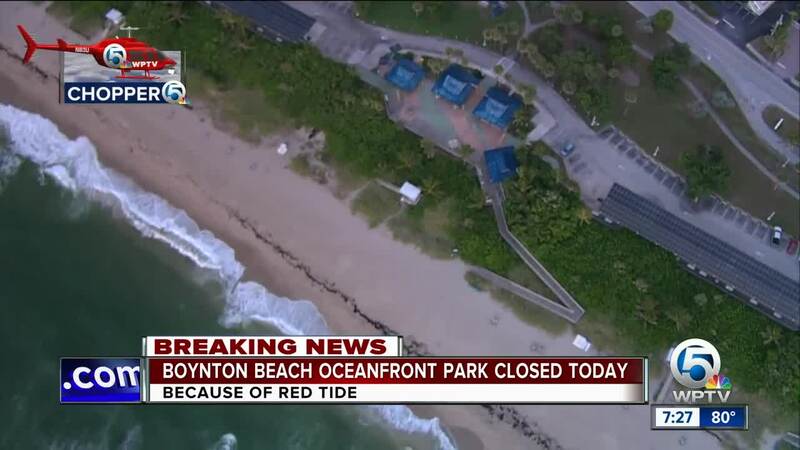 This is the most southern beach in Palm Beach County to close because of red tide concerns. Loggerhead Marinelife Center works to protect wildlife | What's the impact on animals? 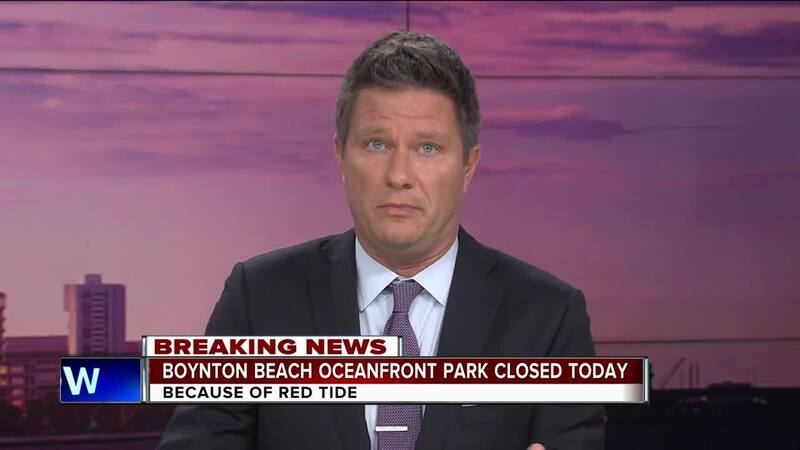 | Red tide affects water sports | Tourism officials questioned about response | Water woes cause woman to leave Fla.
Fishermen at the Boynton Beach Inlet said Wednesday they have noticed fewer visitors this week than normal. Various levels of red tide have been detected this week from St. Lucie County to Palm Beach County, prompting beach closures for multiple days. On Wednesday, tests detected low concentrations of red tide at Waveland Beach and Dollman Park Beach in southern St. Lucie County. Waters off Boca Raton are also being tested for red tide but results have not been released. Lifeguards and staff at the closed locations are reporting continued irritation. Parking lots, picnic areas, and pavilions not on the beach will continue to be open. Some beaches north of Miami are also closed because of the rare red tide outbreak. Miami-Dade County Mayor Carlos Gimenez tweeted Thursday that public beaches north of Haulover Inlet were closed after lab tests confirmed the presence of the toxic algae that has caused massive fish kills on Florida's Gulf coast. The Florida Fish and Wildlife Conservation Commission has established a fish kill hotline at 800-636-0511 to report fish kills, diseased fish or fish with other abnormalities. A NOAA forecast predicts conditions could remain in the moderate range through Friday in Palm Beach County. The Florida Department of Environmental Protection is offering $3 million in grants to St. Lucie, Martin, Palm Beach, Broward and Miami-Dade counties to help mitigate the effects of red tide, according to Gov. Rick Scott's office.